Amtrak’s California Zephyr heads east through Palisade, Colo., in June 2011. 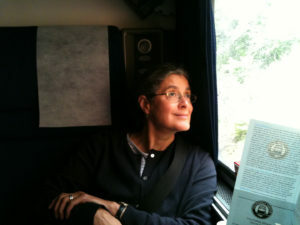 Gretchen Schaefer on the California Zephyr, 2011. Hubley Archives. is very brief. I remember being placed in a dark upholstered seat, under dim yellow light, in a passenger coach in or around Augusta, Maine. The family Ford had died on a bridge and we took the train back to Portland. Those were the last years of passenger rail on the Maine Central Railroad, and I was 4 or 5 years old. 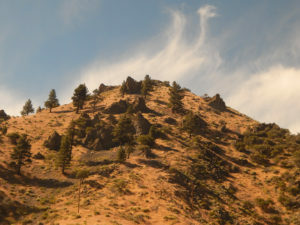 A hill in the Sierra Nevada, seen from the Zephyr in June 2017. Hubley Archives. My father carried me into the house from the taxi, a yellow car with big fins, that lingered idling on Richland Street. At some point in childhood I started reading Model Railroader magazine and even attempted to build a layout. It was pathetic. 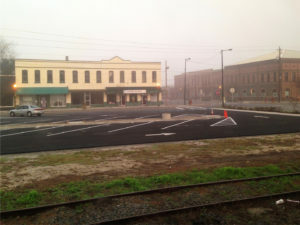 I had no money and no skills, and the trains never ran on the South Portland & Mississippi. I envied my cousins, accomplished model railroaders who had a fine layout in the basement, accessed via a trapdoor in the side porch, of their home in Bangor. My family visited Boston sometimes and I was captivated by the subways, the smell of ozone and hot grease and dust, the screech of steel wheels on steel rails. I wanted to build a model subway layout with glass covering the tunnels. That never happened. 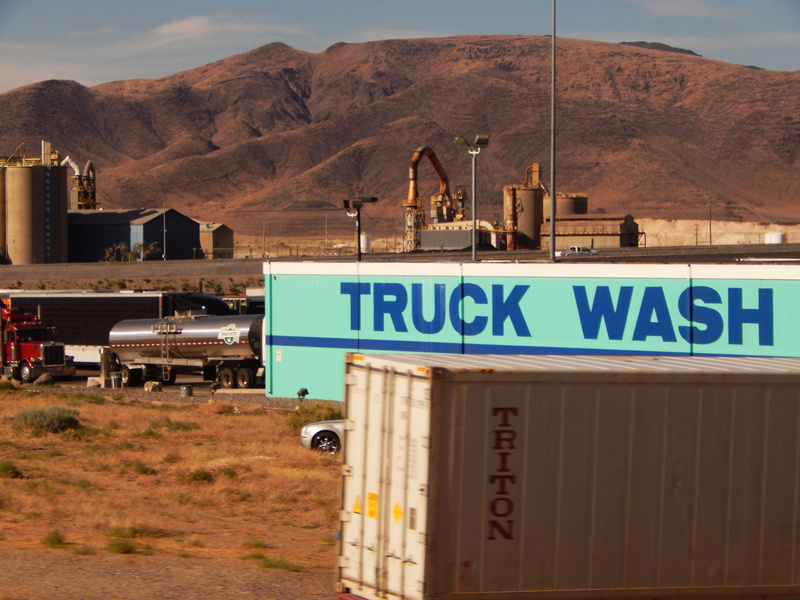 Rolling through Colorado in June 2011. Photo by Gretchen Schaefer. On a cold November morning in late 1968, my mother kindly brought me to the Grand Trunk railroad yard on India Street to see a steam locomotive. 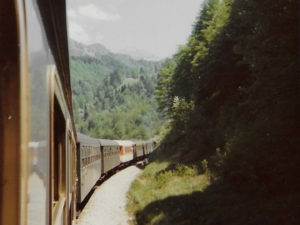 It was pulling a foliage excursion train to Island Pond, Vt.
Yugoslavia by train, 1976. Hubley Archives. I can’t remember if we saw the locomotive or not, but the rail yard seemed pretty serious, heavy rails dense on the ground and treacherous, shining and slick. A few years later I took that foliage train northwest a few times — behind diesel-electric locomotives, as steam was all done by then. 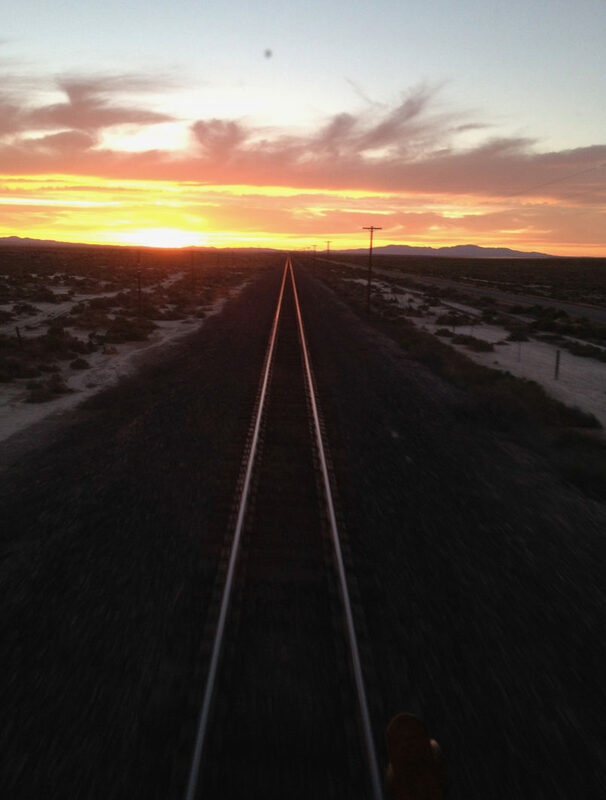 I love trains and I always have. In these days of encroaching old age, the reading that pleases me the most — after pop and country music history of the 20th century — is about trains. I observe each car of the freight trains that hold me up at grade crossings. At work and at home, I pause to listen when trains sound their horns, though there’s rarely any difference from one instance to the next. We get a particular thrill from hearing Amtrak’s Downeaster go calling through the woods behind our house. 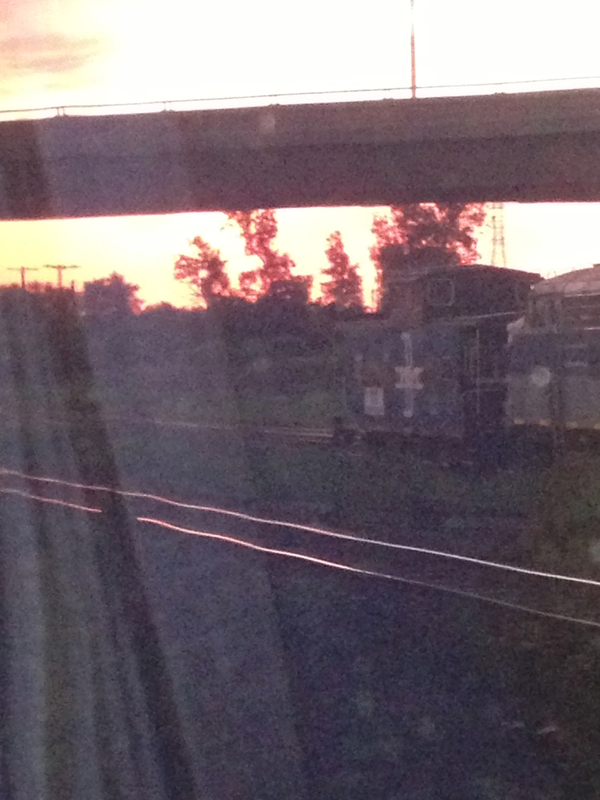 Scenic views from our maiden voyage on the Zephyr. Hubley Archives. For years I carried a torch for O.R. Cummings’ history of the Portland-Lewiston electric interurban line, whose roadbed we sometimes stroll, and finally found the booklet at a model railroad show in early 2017 for the bargain price of $0.00. 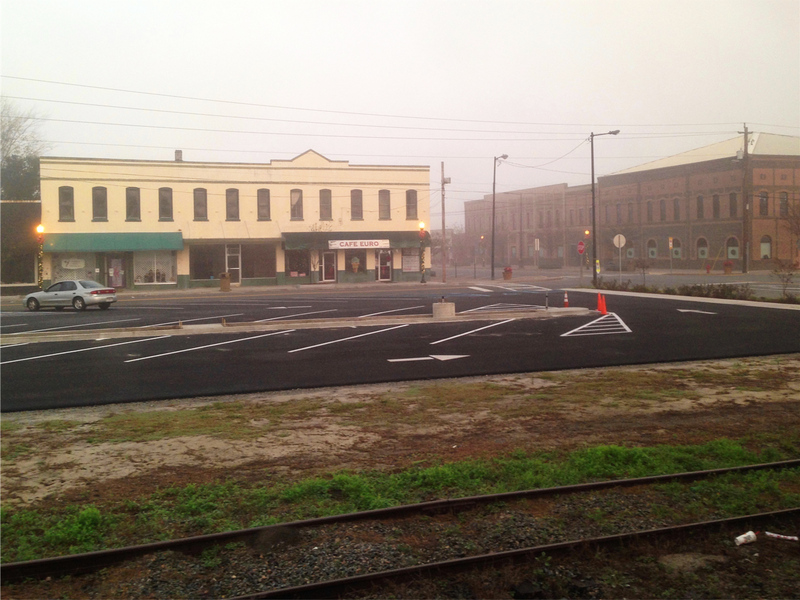 Jesup, Ga., seen from the Silver Meteor, December 2015. Hubley Archives. But the love for trains is an uneasy love. No one shames you for it, exactly, but there’s a comprehension gap at best and at worst, a kind of amused pity because one is waxing so romantic over something so, well, unromantic. Seen objectively, railroading can be a brutal business, physically and ethically. 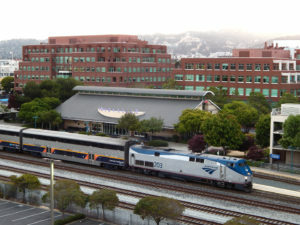 What better view from a hotel window on a hopeful early morning: the Amtrak station in Emeryville, Calif. Hubley Archives. It’s easy to make a fool of a train lover (it’s a favorite pastime for Republicans in Congress). American passenger trains are slow at best and really slow at worst (see previous parenthetical comment). 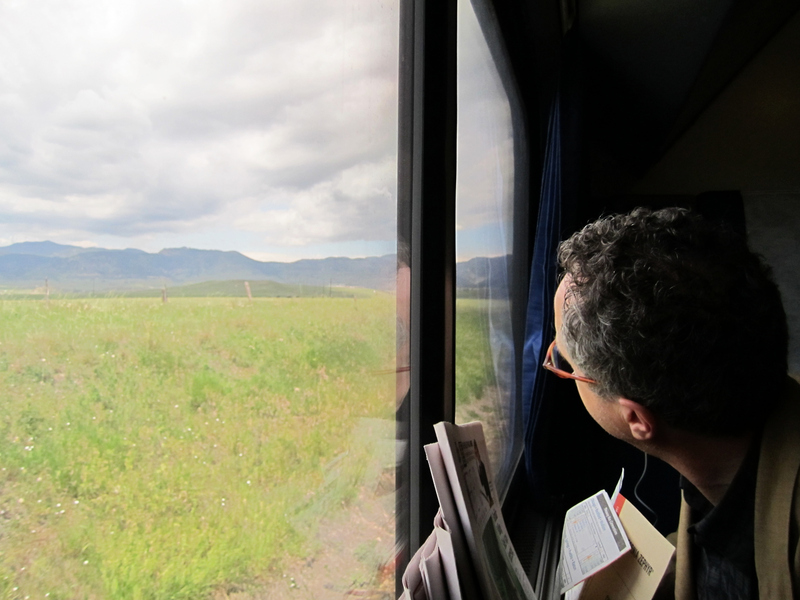 All that we train lovers ask of the train is a nice time, and so often what we get is a bus ride through New York state, eating sandwiches off our laps (2013, Lake Shore Limited). Too early for breakfast on the Zephyr, 2013. Hubley Archives. So train lovers are an awkward minority, and I can say this as a member, although I don’t express my love by spending hours at trackside awaiting a photo opp nor by wearing an engineer’s cap and overalls to the model railroad expo. But they never will, preferring to fly, drive all day or ride the bus. Somewhere swampy on the way to Florida on the Silver Meteor. Hubley Archives. 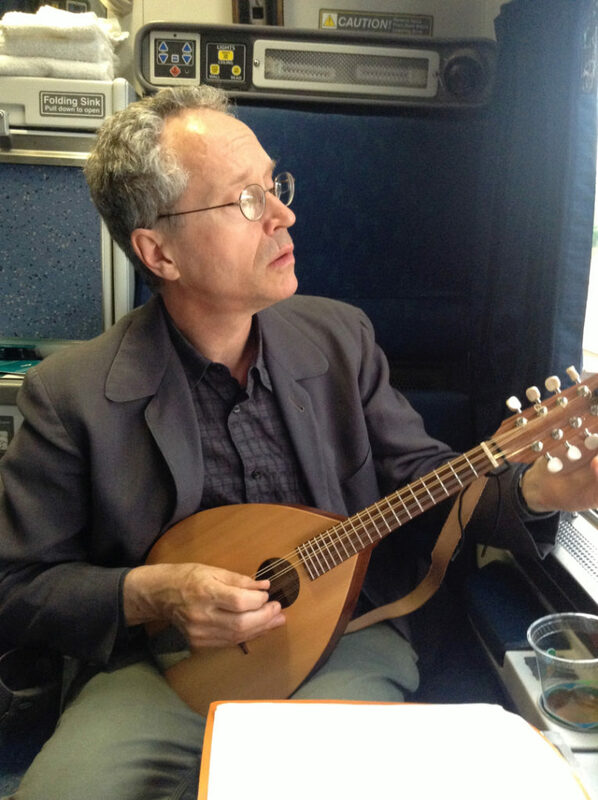 Tuning up on the Lake Shore Limited, 2013. Photo by Gretchen Schaefer. Steve, the trains still run. The fact that no one rides the truss rods anymore doesn’t mean trains aren’t relevant. Grabbing a train to flee a failed love affair is no less poignant because nowadays you can get a beer and Snickers to ease the sting — and it may be more poignant, because how pathetic is that? You want relevance? The Lac-Mégantic train tragedy has a distinctly 21st-century feel to it, wouldn’t you say? 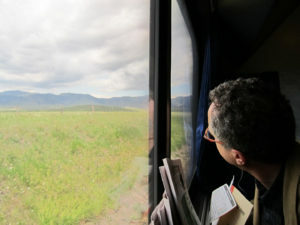 At the same time, I will admit that writing about the Amtrak experience is really a challenge. I believe it’s possible to touch the soul with a song set on the Northeast Regional — the name alone is poetry — but I just haven’t figured out how to do it yet. First-ever night on the Lake Shore Limited, 2011. Hubley Archives. I am blessed in having found a companion who loves trains too. 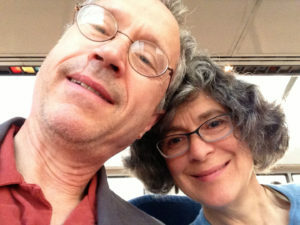 Gretchen Schaefer, my partner in life and in the acoustic country duo Day for Night, and I tend to reserve our vacation dollars for travel by train, particularly for trips that enable us to hole up in a train roomette, the smaller size of Amtrak sleeping compartment, for many hours or a few days. The Zephyr takes it slow around a curve in the Sierra Nevada. Hubley Archives. 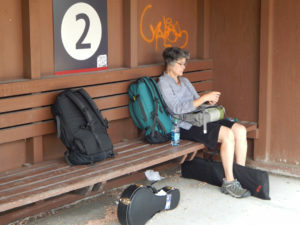 Always a personal imperative, the train became something of a musical haven for us in 2011. 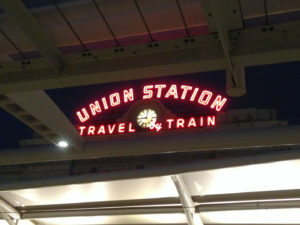 Our first train trip to the West was a mind-bending expedition that included a crossing of the Rockies and visits to Grand Junction, the Colorado National Monument and little Palisade, land of wine grapes, cherries and peaches. Waiting for a train in Mystic, Conn. Hubley Archives. That was the first year we had instruments small enough to travel with: a mandolin for me and a Martin Backpacker guitar for Gretchen. It was also the year we decided to try Amtrak’s sleeping accommodations: specifically, the tiny roomettes. Words to live by. 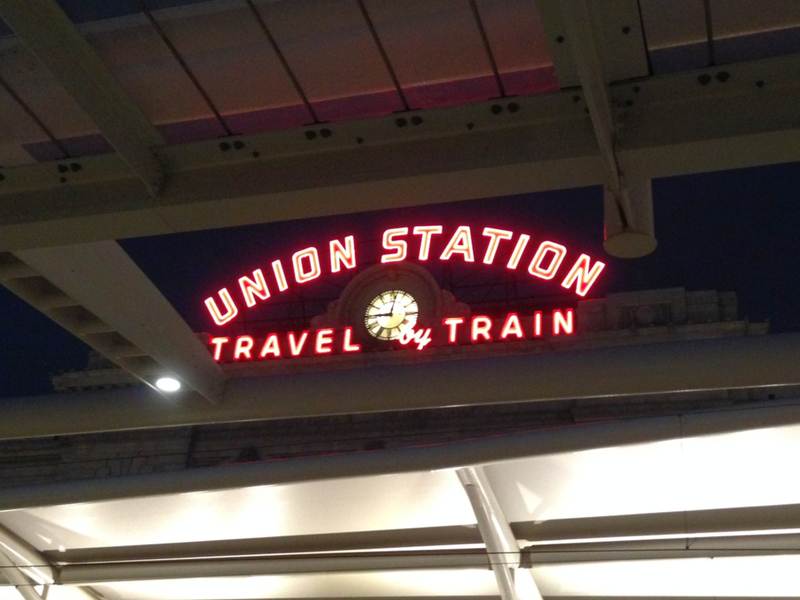 Union Station, Denver. Hubley Archives. There’s a big window so you can see western Massachusetts woods, Chicago warehouses, Iowa cornfields and Rocky Mountains going by; and there’s interior glass facing the corridor so you can observe humanity going by should you choose to leave the curtains open. The interior glass lets enough sound pass to inform the neighbors that there are cool musicians nearby, but not enough to create a public nuisance. 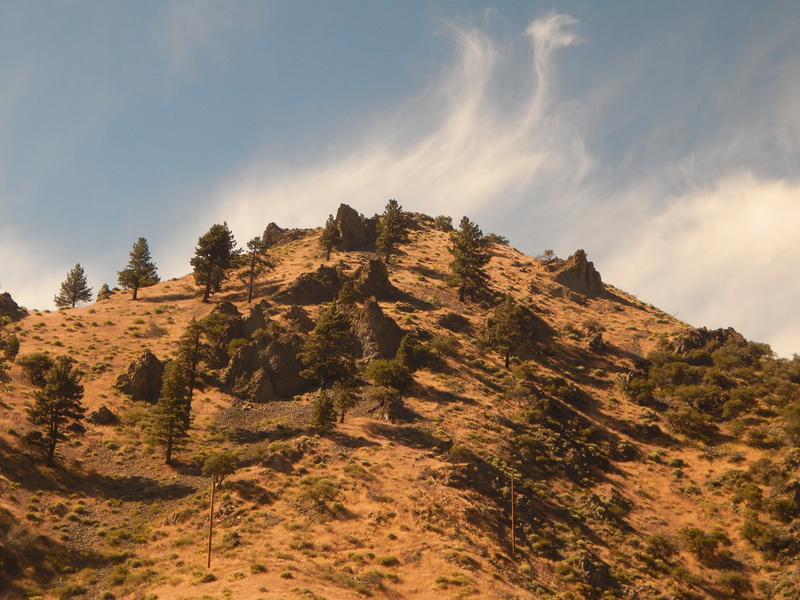 Looking west from the tail end of the California Zephyr. Hubley Archives. In 2011, we rode the Downeaster to Boston, the LSL to Chicago and the Zephyr out to Grand Junction, Colo., on the Utah border. It was on the LSL that we first played music on a train, establishing the routine we’ve observed ever since: tiny instruments, booze and snacks, passers-by swaying down the unsteady corridor, the world’s fascinations speeding past to be savored or ignored. What worlds we traversed in that two-day ride: The waters of upstate New York at dusk, the hideous Gary Works in Indiana, the sun on the green fields of Illinois and Iowa, the foul feedlots of Nebraska and eastern Colorado, the red Rockies with floodwaters rushing through. And what an intimate way to play music: acoustically, bodily, hedonically, geographically intimate. 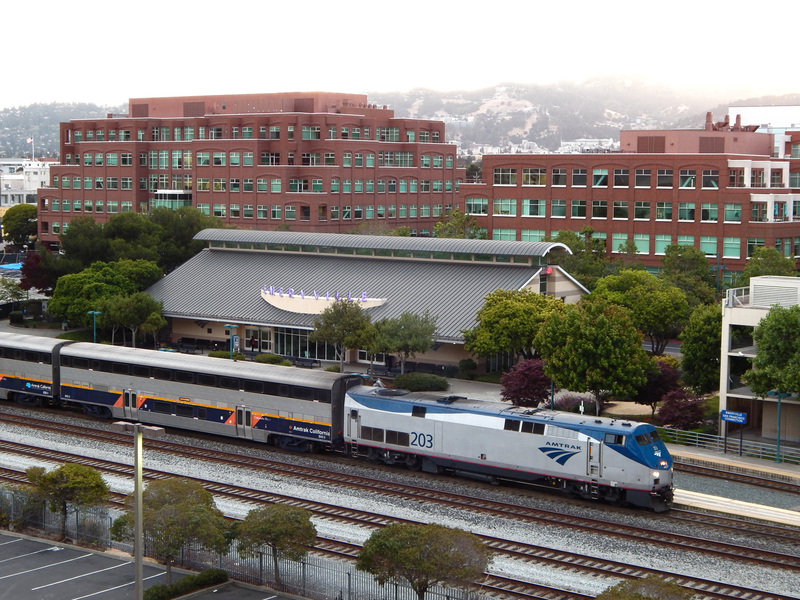 If you love trains and love music, how could it get any better? It’s not exactly nirvana — too many stimuli — but it’s certainly a kind of bliss where all good things are present for you, and your only responsibility is to be receptive to them (and to show your ticket when the conductor asks for it. And to not be a jerk). At night the roomette seats convert to little beds, one up, one down. It’s not the best sleep in terms of becoming rested, but it does add another dimension, a psychic Instagram filter, to the unique phenomenological experience that is long-distance train travel. The whistle howls, dull fluorescent platform lights shine in your face during station stops in the wee small hours, the whistle howls, the train motion is back and forth, up and down, side to side; the whistle howls. Then you get up, feel the full glory of introversion during an awkward breakfast with strangers in the dining car, and return to your little world behind glass, free to read, write, make music or just become one with the passing world. A Boston & Maine caboose somewhere in upstate New York, June 2013. Hubley Archives. My love of trains, like any thought pattern imprinted early on, is hard to explain. I love trains because I have always loved trains, which isn’t much of a reason aside from being true. Perhaps this explains the challenge of capturing the appeal of trains in a song, especially while you’re sitting around for five hours, with no end in sight and no information from Amtrak, in the Rensselaer railroad station. But it’s easy to explain why Gretchen and I love to ride trains. Even riding coach, they are comfortable, the sightseeing is pleasant and one has no responsibility, etc. Non-train people complain about trains’ slowness and lateness, but for us time is not an issue (setting aside that Rensselaer thing) because the train, unlike the car, plane or bus, is as much the destination as it is the transportation. And taking a sleeping accommodation, as we often do, provides still another benefit that, similar to the way caffeine enhances the effects of aspirin, heightens all the pleasures of the train: privacy. Gretchen and I are a reclusive and introverted couple who, it seems, move through the world at all times in a virtual train compartment of mutual interests and fascinations, not least with one another. 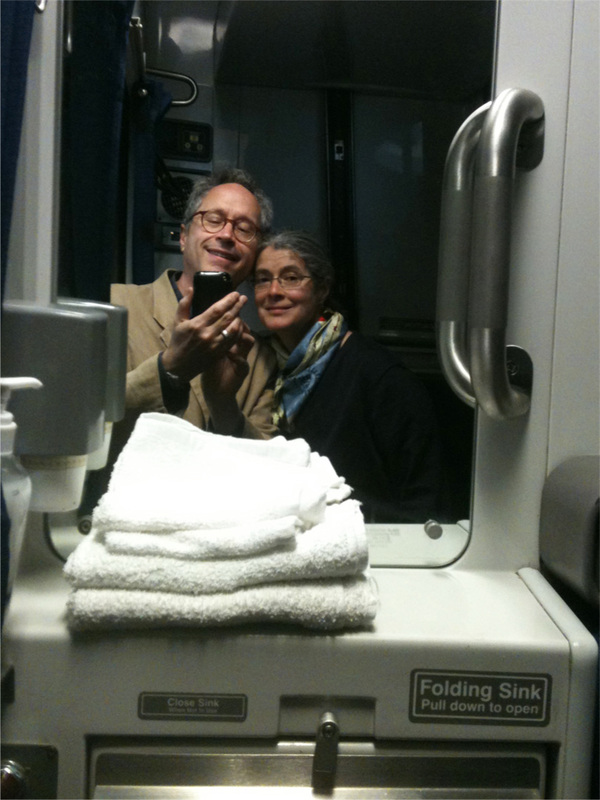 The Amtrak roomette is not just the conveyance of choice, but a perfect metaphor for us. Enjoy a couple of train songs from the Day for Night archives. Mr. Engineer (Jimmy Martin-Paul Williams) We first heard Jimmy Martin perform this on the “Trains” episode of Bob Dylan’s Theme Time Radio Hour. On that same episode we also heard (and subsequently learned) “Train of Love” by Johnny Cash. Louis Armstrong’s “2:19 Blues” is still out there waiting for us. From an October 2013 performance at the Royal Bean, Yarmouth. Songs of Universal, Inc. I Remember the Railroad (Gene Clark) I have loved this song since I first got my mitts on Gene Clark’s LP Roadmaster in 1977, but thought it was too much of a dirge to perform. Not so, as this 2011 living room performance suggests. Irving Music, Inc. Text and “Hubley Archives” images copyright © 2017 by Douglas L. Hubley. All rights reserved.